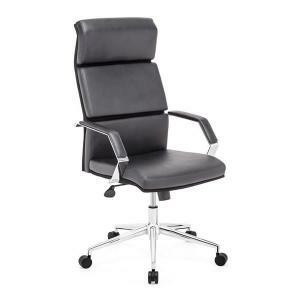 An extra cushioned and comfortable executive and task office chair. This is a great work chair! The Lider Comfort office chair has a leatherette wrapped seat and back cushions with chrome solid steel arms with leatherette pads. There is a height and tilt adjustment with a 5 point chromed steel rolling base. W27.5" x D27.5" x H44~47.6", SeatW18", SeatD18", SeatH17.7~20.5", ArmH23.6~26.8"